Brooke is a student at Lawndale High School and is a peer of Quinn Morgendorffer and the other members of the Fashion Club. Brooke was first introduced and makes her only speaking appearance in the episode "Too Cute". In "Too Cute", Brooke receives a nose job from Dr. Shar which increases her popularity at LHS. Quinn states that Brooke's nose "had an extra bone in it" before the operation and was not cute (Quinn, however, is not a reliable narrator). Brooke's level of "cute" moves to "supercute" after Dr. Shar performs liposuction on Brooke's waist and gives Brooke collagen injections in her lips. At one point during the episode, Brooke is considered for Fashion Club membership by Sandi, who was jealous of Quinn's popularity as of the events of "Too Cute". However, Brooke suffers a "nasal relapse" and the collagen from her upper lip somehow slides to her lower lip, her "cuteness" suffers and she falls out of consideration for Fashion Club membership. 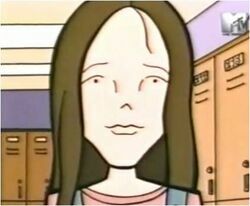 Whenever Brooke is seen as a background character after "Too Cute" (for example, standing next to Stacy in "Fat Like Me"), she maintains her collagened-tight-waisted appearance of her "supercute" state. One must assume that Dr. Shar, or some other competent plastic surgeon, was able to repair the damage at some point in the future. Later mentions of Brooke are those where Fashion Club members detail her fashion faux pas, such as coming to school in "crushed velour that can't be uncrushed" and trying to pass off stone-washed jeans as retro. In "The Old and the Beautiful", Quinn implies that Brooke dresses "like a tramp" but the velour top is seen as far more important and terrible. These fashion failures are undoubtedly the reason Brooke has been unable to crack the Fashion Club and become a member. Brooke makes repeated appearances in stories as a social climber and Fashion Club wannabe, particular in alternate universe retellings of "Too Cute". Often she's presented as ill-confident and needy, in line with her desire to please in her speaking appearance. In Dennis' "Turnabout Confusion", her desire to be in the Fashion Club makes her one of the players in the all-out social warfare. In Kristen Bealer's post-canon "Telling Tales Out of School", Brooke's social actions are part of an unstoppable wave of gossip that threatens to bury David Sorenson. Roentgen's "Revenge of the Attack" has Brooke form a new Fashion Club after the old one dissolves. Several fics have Brooke as antagonist or outright enemy. Fhujeth's "After the Disaster" has Brooke, after Tiffany is brain-damaged in a car accident, refuses to be around her in case being around "a retarded student" hurts her popularity. Oni's "At the Crossroads" (requires the "Rosetta Stone"), where she tries to blackmail Sandi after learning the other girl is gay. Kristen Bealer's "Before the Deprogramming" has her as a spoilt bully and enemy of a younger Jane Lane when they were both in Girl Scouts. In a Random Pairing Challenge Iron Chef, tjdolf paired up Brooke with Lindy in "My beautiful striped bell-bottoms" (which also established Brooke has horrific choices in fashion). This page was last edited on 27 May 2018, at 19:54.